Vice-President Yemi Osinbajo is currently presiding over the federal executive council (FEC) meeting at the presidential villa, Abuja. 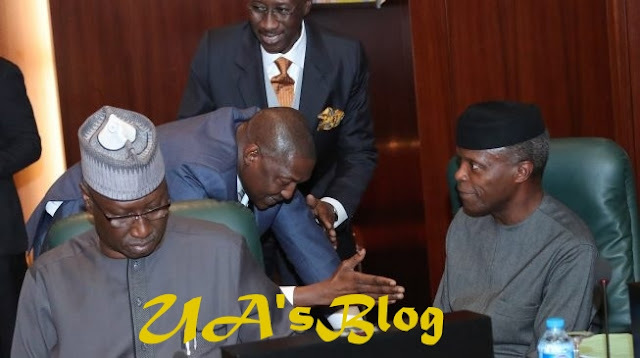 Osinbajo took charge of the weekly meeting based on the absence of President Muhammadu Buhari who is on his way to Maiduguri, Borno state capital, for the annual conference of the chief of army staff (COAS). The meeting started with the national anthem following the arrival of Osinbajo at 11:03am. The opening prayers were said by Okechukwu Enelamah, minister of trade and investment, and Suleiman Adamu, his water resources counterpart. The meeting was attended by Boss Mustapha, secretary to the government of the federation, and 18 ministers. Among the ministers in attendance are Rotimi Amaechi, Adamu Adamu, AbdulRahaman Dambazau, Audu Ogbe, Adebayo Shittu, Mohammed Musa Bello, Zainab Ahmed, Udoma Udoma and Usani Usani.